B is ….. for Banana! I peeled a couple of kilograms of bananas tonight to make Choc Banana popsicles. The perfect ripeness with the skin a deep tawny yellow and flecks of black spots, and giving away very easily to reveal the treasure inside. Soft and full of flavour, the deep banana flavour punctuated with notes of cloves and honey.Yum! There is nothing worse than a banana on either side. Too young and the taste is green and unpleasant, too old and I shy at the mushy texture. As I was peeling away, I started thinking about all things banana…..
And then I started thinking about banana paddlepops, and how sometimes after school I used to fix myself a snack by slicing bananas on a plate and dusting (probably quite heavy handedly) with milo, sugar and cinnamon. Yum! As I looked over at the pile of banana skins, it seemed such a waste to throw them out, and I wondered if there was any use for them. Surely not, but lo and behold I discovered this recipe for a banana skin cake. You can read about the rest of the recipe over here. To use the banana skins you cut the ends off, and put the rest of the peel in a container and fill it with water. Every day you change the water, until the skins are really soft and the water stays clear. 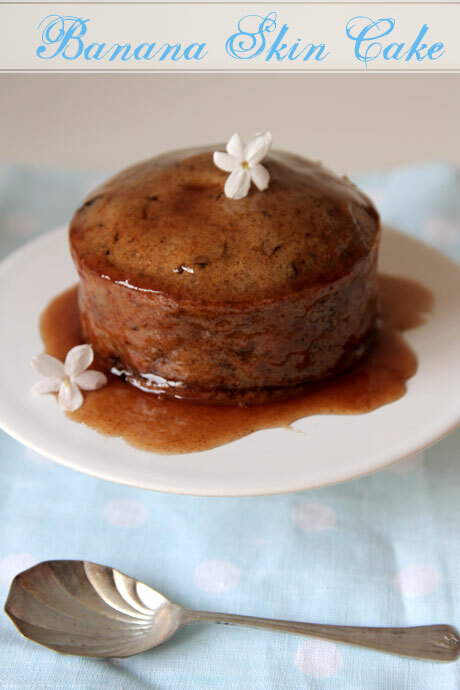 When they are ready you blend, strain and mix with the other ingredients and turn into a delicious cake, topped off with a luxurious caramel sauce. Sounds pretty good to me! So right now, as my choc-banana popsicles sit in the freezer on the counter I have a container full of banana skins sitting in water. Let the experimenting begin! Fingers crossed! After about day 5 of changing the water, I gave up. I could not justify the amount of water that I kept having to pour down the sink, having to look at the black banana skins each time I walked into the kitchen, and did not have the heart to persivere and then find out the cake wasn’t all that delicious after all. So now we all know why there aren’t all that many banana-skin floating around!